Please complete one form for each dog attending Dog Obedience Training at The Canine Culture™. When you submit this form, your reservation will be e-mailed to us. To secure your space, payment in full must accompany registration. *The Canine Culture will also accept a current (within the past 12 months) report of positive blood titers for Parvo and/or Distemper. Payment Info Payment in full is required to hold your spot. Our office will contact you to confirm a spot is available after which you will be required to provide your payment. Refund Policy: Since we strictly limit the size of our classes, if you register, a spot will be held for you. Therefore, no refunds are allowed under any circumstances. If you miss three (3) or more classes in a series your dog will not graduate. Private Lessons Refund Policy: Lessons must be paid at time of scheduling. Discounted Packages of Private Lessons must be paid and scheduled in advance. Your scheduled time(s) is reserved for you exclusively. If you cannot keep your appointment, your fees will not be refunded. Owner shall defend, indemnify, and hold OFF LEAD, Inc. DBA The Canine Culture™, harmless from, any and all claims, demands, actions, collections, and lawsuits, for any costs, expenses, fees, injuries to persons or property, illnesses, or damages arising out of the Owner’s and/or Handler’s participation, and the participation of the Owner’s Dog(s) in this training. Owner agrees to sign a hard copy of this agreement upon arrival for first lesson. Submission of this form constitutes a contract with The Canine Culture™. By submitting this form you are representing that you have read our policies and agree to abide by them. If you have questions, please call: (209) 931-0758, or send us a message using the form on the right hand side of this page. 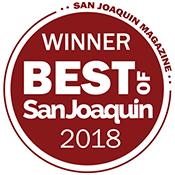 Best Of San Joaquin Magazine 2018! About Jack & Kathy Weber and The Canine Culture. Aerial overview of our facilities. surrounding areas of the San Joaquin Valley & Northern California. 2019 - Jan. *9, 16, 23, 30, Feb. 6, 13, 20, 27. 2019 - March *6, 13, 20, 27, April 3, 10, 17, 24. 2019 - May *1, 8, 15, 22, 29, June 5, 12, 19. 2019 - Aug *7, 14, 21, 28, Sept. 4, 11, 18, 25.